Look at this 2018 Chevrolet Silverado 1500 LTZ. Its Automatic transmission and Gas V8 5.3L/325 engine will keep you going. This Chevrolet Silverado 1500 has the following options: WIRELESS CHARGING, WHEELS, 20" X 9" (50.8 CM X 22.9 CM) CHROME, TRANSMISSION, 6-SPEED AUTOMATIC, ELECTRONICALLY CONTROLLED with overdrive and tow/haul mode. Includes Cruise Grade Braking and Powertrain Grade Braking (STD), TRAILER BRAKE CONTROLLER, INTEGRATED, TIRES, P275/55R20 ALL-SEASON, BLACKWALL, TEXAS EDITION for Crew Cab and Double Cab models. On LTZ includes (RD2) 20" x 9" chrome wheels and (UQA) Bose Sound speakers and Texas Edition badging (N37) manual tilt and telescopic steering column included with (L83) 5.3L EcoTec3 V8 engine. ), STEERING WHEEL, HEATED, LEATHER-WRAPPED AND COLOR-KEYED, SEATS, FRONT FULL-FEATURE LEATHER-APPOINTED BUCKET WITH (KA1) HEATED SEAT CUSHIONS AND SEAT BACKS includes 10-way power driver and front passenger seat adjusters, including 2-way power lumbar control, 2-position driver memory, adjustable head restraints, (D07) floor console, storage pockets and (K4C) Wireless charging., SEATING, HEATED AND VENTED PERFORATED LEATHER-APPOINTED FRONT BUCKET, and REAR AXLE, 3.42 RATIO. Stop by and visit us at Cavender Buick GMC West, 7400 West 1604 North, San Antonio, TX 78254. 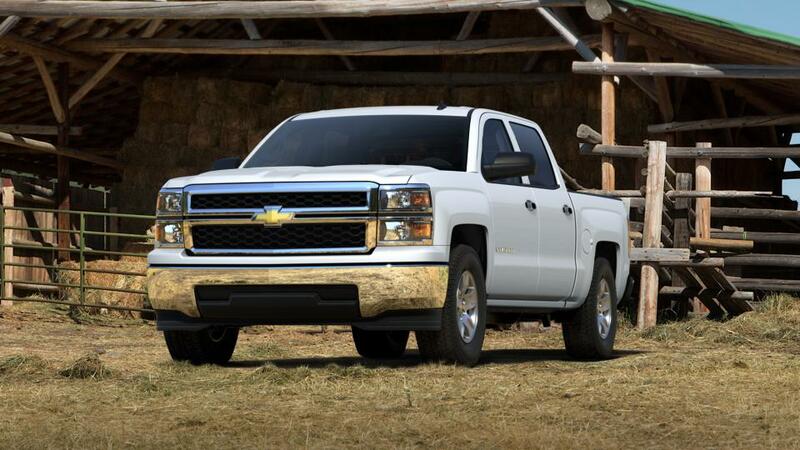 Check out this 2013 Chevrolet Silverado 1500 Work Truck. Its Automatic transmission and Gas V6 4.3L/262 engine will keep you going. 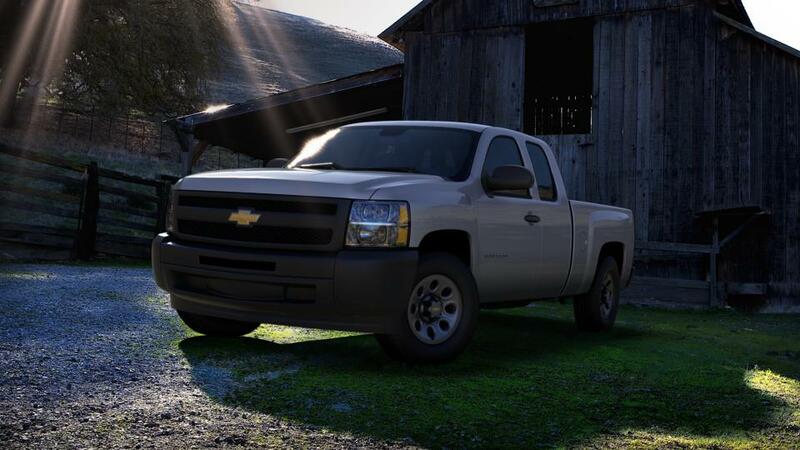 This Chevrolet Silverado 1500 comes equipped with these options: WORK TRUCK PREFERRED EQUIPMENT GROUP includes standard equipment, WINDOWS, LOCKS AND MIRRORS, POWER deletes Remote Keyless Entry. Provides power driver and passenger front side windows with uplevel door panels on a base trim level vehicle. Includes RPO (DL8) outside heated power-adjustable manual folding mirrors, RPO (AU3) power door locks and RPO (UQ3) speaker system. C/K***43-53 models include rear door power windows and locks., WHEELS, 4 - 17" X 7.5" (43.2 CM X 19.1 CM) STEEL, 6-LUG PAINTED includes painted center caps (spare wheel will not cosmetically match the other 4 wheels) (STD), TRANSMISSION, 4-SPEED AUTOMATIC, ELECTRONICALLY CONTROLLED with overdrive and tow/haul mode (STD), TIRES, P245/70R17 ALL-SEASON, BLACKWALL includes a blackwall spare tire (Requires 2WD models.) (STD), SUSPENSION PACKAGE, SOLID SMOOTH RIDE includes 35 mm piston twin tube shocks and 36mm front stabilizer bar (STD), SILVER ICE METALLIC, SEATS, FRONT 40/20/40 SPLIT-BENCH, 3-PASSENGER, DRIVER AND FRONT PASSENGER MANUAL RECLINING with outboard head restraints and center fold-down armrest with storage (STD), SEAT ADJUSTER, MANUAL LUMBAR CONTROL ON THE DRIVER-SIDE, and REAR AXLE, 3.23 RATIO. Stop by and visit us at Cavender Buick GMC West, 7400 West 1604 North, San Antonio, TX 78254. Come see this 2014 Chevrolet Silverado 1500 LT. Its Automatic transmission and Gas/Ethanol V8 5.3L/325 engine will keep you going. This Chevrolet Silverado 1500 features the following options: WHEELS, 20" X 9" (50.8 CM X 22.9 CM) POLISHED-ALUMINUM, TRANSMISSION, 6-SPEED AUTOMATIC, ELECTRONICALLY CONTROLLED with overdrive and tow/haul mode. Includes Cruise Grade Braking and Powertrain Grade Braking (STD), TRAILERING PACKAGE includes trailer hitch, 7-pin and 4-pin connectors (Includes (G80) locking rear differential., TIRES, P275/55R20 ALL-SEASON, BLACKWALL, TIRE, SPARE P265/70R17 ALL-SEASON, BLACKWALL, THEFT-DETERRENT SYSTEM, UNAUTHORIZED ENTRY, TEXAS EDITION, 1LT TRIM includes (DP6) body-color mirror caps, (D75) body-color door handles, Texas Edition badging and 20" wheels. (Includes (Z82) Trailering Package, (G80) locking differential and (RD4) 20" x 9" polished-aluminum wheels., SUSPENSION PACKAGE, HIGH PERFORMANCE, SUMMIT WHITE, and STEERING COLUMN, MANUAL TILT AND TELESCOPING. See it for yourself at Cavender Buick GMC West, 7400 West 1604 North, San Antonio, TX 78254. Check out this 2011 Chevrolet Silverado 1500 LT. Its Automatic transmission and Gas/Ethanol V8 4.8L/293 engine will keep you going. This Chevrolet Silverado 1500 comes equipped with these options: XM RADIO, DELETE, WHEELS, 4-17" X 7.5" (43.2 CM X 19.1 CM) 6-LUG CHROME-STYLED STEEL includes chrome center caps (spare wheel will not cosmetically match the other 4 wheels) (STD), TRANSMISSION, 4-SPEED AUTOMATIC, ELECTRONICALLY CONTROLLED with overdrive and tow/haul mode (STD), TIRES, P265/70R17 ALL-SEASON, BLACKWALL includes a blackwall spare tire (STD), SUSPENSION PACKAGE, HANDLING/TRAILERING, HEAVY-DUTY includes 46 mm piston monotube shocks and 36mm front stabilizer bar (Includes 36mm front stabilizer bar when (NHT) Max Trailering Pack is ordered.) (STD), SUMMIT WHITE, SEATS, FRONT 40/20/40 SPLIT-BENCH, 3-PASSENGER, DRIVER AND FRONT PASSENGER MANUAL RECLINING center fold-down armrest with storage, lockable storage compartment in seat cushion (includes auxiliary power outlet), adjustable outboard head restraints and storage pockets on Extended and Crew Cab models (STD), REAR AXLE, 3.42 RATIO, PAINT, SOLID, and ONSTAR, DELETE. Stop by and visit us at Cavender Buick GMC West, 7400 West 1604 North, San Antonio, TX 78254. Check out this 2014 Chevrolet Silverado 1500 LT. Its Automatic transmission and Gas/Ethanol V8 5.3L/325 engine will keep you going. This Chevrolet Silverado 1500 comes equipped with these options: WHEELS, 20" X 9" (50.8 CM X 22.9 CM) POLISHED-ALUMINUM, TRANSMISSION, 6-SPEED AUTOMATIC, ELECTRONICALLY CONTROLLED with overdrive and tow/haul mode. Includes Cruise Grade Braking and Powertrain Grade Braking (STD), TRAILERING PACKAGE includes trailer hitch, 7-pin and 4-pin connectors (Includes (G80) locking rear differential., TIRES, P275/55R20 ALL-SEASON, BLACKWALL, TIRE, SPARE P265/70R17 ALL-SEASON, BLACKWALL, THEFT-DETERRENT SYSTEM, UNAUTHORIZED ENTRY, TEXAS EDITION, 1LT TRIM includes (DP6) body-color mirror caps, (D75) body-color door handles, Texas Edition badging and 20" wheels. (Includes (Z82) Trailering Package, (G80) locking differential and (RD4) 20" x 9" polished-aluminum wheels., SUSPENSION PACKAGE, HIGH PERFORMANCE, SUMMIT WHITE, and STEERING COLUMN, MANUAL TILT AND TELESCOPING. Stop by and visit us at Cavender Buick GMC West, 7400 West 1604 North, San Antonio, TX 78254. Look at this 2016 Chevrolet Silverado 1500 LT. Its Automatic transmission and Gas V8 5.3L/325 engine will keep you going. This Chevrolet Silverado 1500 features the following options: WHEELS, 20" X 9" (50.8 CM X 22.9 CM) POLISHED-ALUMINUM, TRANSMISSION, 6-SPEED AUTOMATIC, ELECTRONICALLY CONTROLLED with overdrive and tow/haul mode. Includes Cruise Grade Braking and Powertrain Grade Braking (STD), TRAILERING PACKAGE includes trailer hitch, 7-pin and 4-pin connectors Includes (G80) locking rear differential., TIRES, P275/55R20 ALL-SEASON, BLACKWALL, TIRE, SPARE P265/70R17 ALL-SEASON, BLACKWALL, THEFT-DETERRENT SYSTEM, UNAUTHORIZED ENTRY, TEXAS EDITION for Crew Cab and Double Cab models. On LT includes (AG1) driver 10-way power seat adjuster with (AZ3) bench seat only, (CJ2) dual-zone climate control, (BTV) Remote Vehicle Starter system, (UVC) Rear Vision Camera, (C49) rear-window defogger, (KI4) 110-volt power outlet and Texas Edition badging (Includes (Z82) Trailering Package, (G80) locking differential and (T3U) LED front fog lamps. (N37) manual tilt and telescopic steering column included with (L83) 5.3L EcoTec3 V8 engine. ), SUSPENSION PACKAGE, HIGH PERFORMANCE, STEERING COLUMN, MANUAL TILT AND TELESCOPING, and SEATS, FRONT 40/20/40 SPLIT-BENCH, 3-PASSENGER, AVAILABLE IN CLOTH OR LEATHER includes driver and front passenger recline with outboard head restraints and center fold-down armrest with storage. Also includes manually adjustable driver lumbar, lockable storage compartment in seat cushion, and storage pockets. (STD) Includes (AG1) driver 10-way power seat-adjuster with (PCM) LT Convenience Package, (PDA) Texas Edition or (PDU) All Star Edition.). See it for yourself at Cavender Buick GMC West, 7400 West 1604 North, San Antonio, TX 78254. Check out this 2018 Chevrolet Silverado 1500 LT. Its Automatic transmission and Gas V8 5.3L/325 engine will keep you going. This Chevrolet Silverado 1500 features the following options: WIRELESS CHARGING, WHEELS, 20" X 9" (50.8 CM X 22.9 CM) POLISHED-ALUMINUM, TRANSMISSION, 6-SPEED AUTOMATIC, ELECTRONICALLY CONTROLLED with overdrive and tow/haul mode. Includes Cruise Grade Braking and Powertrain Grade Braking (STD), TRAILERING PACKAGE includes trailer hitch, 7-pin and 4-pin connectors Includes (G80) locking rear differential., TIRES, P275/55R20 ALL-SEASON, BLACKWALL, TIRE, SPARE P265/70R17 ALL-SEASON, BLACKWALL, THEFT-DETERRENT SYSTEM, UNAUTHORIZED ENTRY, TEXAS EDITION for Crew Cab and Double Cab models. On LT includes (AG1) driver 10-way power seat adjuster with (AZ3) bench seat only, (CJ2) dual-zone climate control, (BTV) Remote Vehicle Starter system, (C49) rear-window defogger, (KI4) 110-volt power outlet and Texas Edition badging Includes (Z82) Trailering Package, (G80) locking differential and (T3U) LED front fog lamps. (N37) manual tilt and telescopic steering column included with (L83) 5.3L EcoTec3 V8 engine. ), STEERING COLUMN, MANUAL TILT AND TELESCOPING, and SEATS, FRONT CLOTH BUCKET WITH (KA1) HEATED SEAT CUSHIONS AND SEAT BACKS includes 10-way power driver and 6-way power front passenger seat adjusters, including driver/front passenger power recline and driver/front passenger power lumbar. Also includes adjustable head restraints, (D07) floor console, storage pockets and (K4C) Wireless charging.. Stop by and visit us at Cavender Buick GMC West, 7400 West 1604 North, San Antonio, TX 78254. Come see this 2018 Chevrolet Silverado 1500 LTZ. Its Automatic transmission and Gas V8 5.3L/325 engine will keep you going. This Chevrolet Silverado 1500 has the following options: WIRELESS CHARGING, WHEELS, 20" X 9" (50.8 CM X 22.9 CM) CHROME, WHEEL, FULL-SIZE SPARE, 17" (43.2 CM) STEEL, TRANSMISSION, 6-SPEED AUTOMATIC, ELECTRONICALLY CONTROLLED with overdrive and tow/haul mode. Includes Cruise Grade Braking and Powertrain Grade Braking (STD), TIRES, P275/55R20 ALL-SEASON, BLACKWALL, TEXAS EDITION for Crew Cab and Double Cab models. On LTZ includes (RD2) 20" x 9" chrome wheels and (UQA) Bose Sound speakers and Texas Edition badging (N37) manual tilt and telescopic steering column included with (L83) 5.3L EcoTec3 V8 engine. ), STEERING WHEEL, HEATED, LEATHER-WRAPPED AND COLOR-KEYED, SEATS, FRONT FULL-FEATURE LEATHER-APPOINTED BUCKET WITH (KA1) HEATED SEAT CUSHIONS AND SEAT BACKS includes 10-way power driver and front passenger seat adjusters, including 2-way power lumbar control, 2-position driver memory, adjustable head restraints, (D07) floor console, storage pockets and (K4C) Wireless charging., SEATING, HEATED AND VENTED PERFORATED LEATHER-APPOINTED FRONT BUCKET, and REAR AXLE, 3.42 RATIO. Stop by and visit us at Cavender Buick GMC, 17811 San Pedro Avenue, San Antonio, TX 78232. Come see this 2008 Chevrolet Silverado 1500 LT with 1LT. Its Automatic transmission and Gas V8 5.3L/323 engine will keep you going. This Chevrolet Silverado 1500 features the following options: WHEELS, 4 - 20" X 8.5" (50.8 CM X 21.6 CM) 5-SPOKE MACHINED ALUMINUM includes (QSS) P275/55R20 touring blackwall tires, (Z60) High-performance suspension package and steel spare (spare wheel will not cosmetically match the other 4 wheels), TRANSMISSION, 4-SPEED AUTOMATIC, ELECTRONICALLY CONTROLLED with overdrive and tow/haul mode (STD), TRAILERING EQUIPMENT, HEAVY-DUTY includes trailering hitch platform and 2-inch receiver, 7-wire harness (harness includes wires for: park lamps, backup lamps, right turn, left turn, electric brake lead, battery and ground) with independent fused trailering circuits mated to a 7-way sealed connector, wiring harness for after-market trailer brake controller (located in the instrument panel harness), and single wire for center high-mounted stop lamp, (K47) high-capacity air cleaner and (KNP) external transmission oil cooler, TIRES, P275/55R20 TOURING, BLACKWALL includes all-season 17" blackwall spare, TEXAS EDITION includes (LY5) Vortec 5.3L V8 SFI engine, (P58) 4-20" x 8.5" (50.8 cm x 21.6 cm) 5-spoke machined aluminum wheels, (DL3) outside heated power-adjustable, power-folding body-colored mirrors, (Z82) heavy-duty trailering equipment, (G80) heavy-duty automatic locking rear differential, (RAE) cargo management system and Texas emblem badging, SUSPENSION PACKAGE, HIGH-PERFORMANCE includes 36mm front stabilizer bar, SEATS, FRONT 40/20/40 SPLIT-BENCH, 3-PASSENGER, DRIVER AND FRONT PASSENGER MANUAL RECLINING center fold-down armrest with storage, lockable storage compartment in seat cushion (includes auxiliary power outlet), adjustable outboard head restraints and storage pockets on Extended and Crew Cab models (STD), REAR AXLE, 3.42 RATIO, PAINT, SOLID (STD), and MIRRORS, OUTSIDE HEATED POWER-ADJUSTABLE, POWER-FOLDING AND DRIVER-SIDE AUTO-DIMMING WITH INTEGRATED TURN SIGNAL INDICATORS. Stop by and visit us at Cavender Buick GMC West, 7400 West 1604 North, San Antonio, TX 78254.